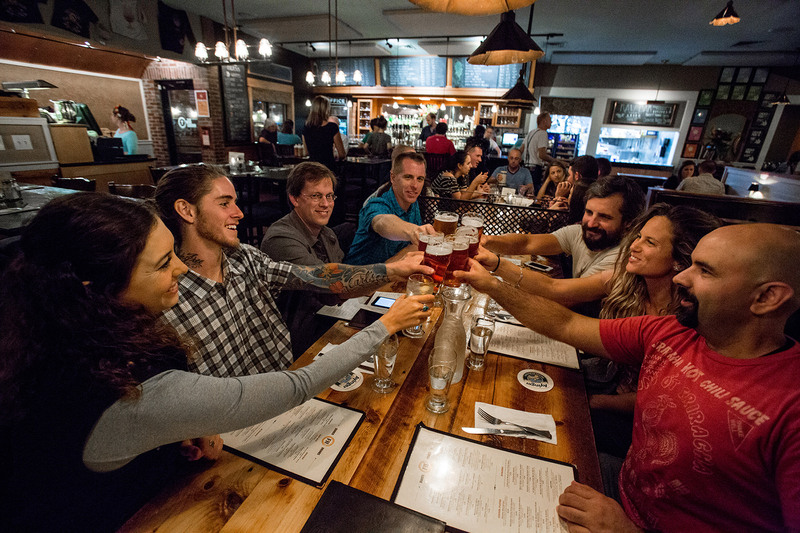 For this installment of Explore like a Local, we visited Burlington, Vermont, just as fall took hold. With its cool nights and warm days, we found this to be the perfect time of year to get outside and get after it. We packed in as many adventures as we could, but found ourselves wishing we had more time (isn’t that always the case when you’re having fun?). Given all of the possible activities in town and within a short drive, we just scratched the surface of this area—all the more reason to go back soon. Located in Northwest Vermont, Burlington is nestled alongside Lake Champlain with roughly 43,000 residents, making it the most populous city in the state. The city has a distinct outdoor and progressive vibe along with a bustling restaurant scene and a busy pedestrian-only area on Church Street. The University of Vermont and Champlain College are both located here and contribute to the energy of the city. The city is served by a convenient airport and a major interstate (I-89), so getting here is easy. The Island Line Trail sits along the waterfront and heads north into Colchester. If you didn’t travel with your bike, head down to Local Motion and rent a bike directly on the path. The bike path is paved and almost completely flat. Approximately 35 minutes out of town, you’ll reach the amazing Colchester Bike Causeway (gravel, not paved). 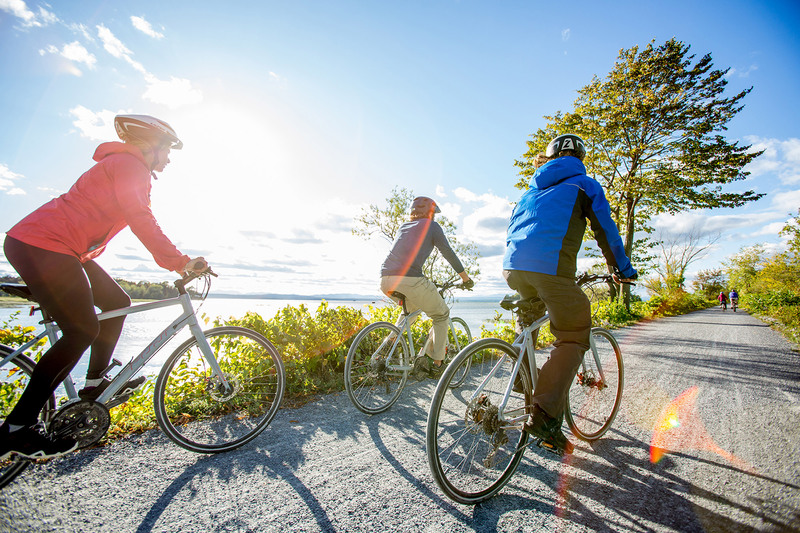 Ride directly out into Lake Champlain on an old rail causeway. Complete the trip out to the island community of South Hero by taking a bike ferry across a 200-foot gap, left open for boat traffic. 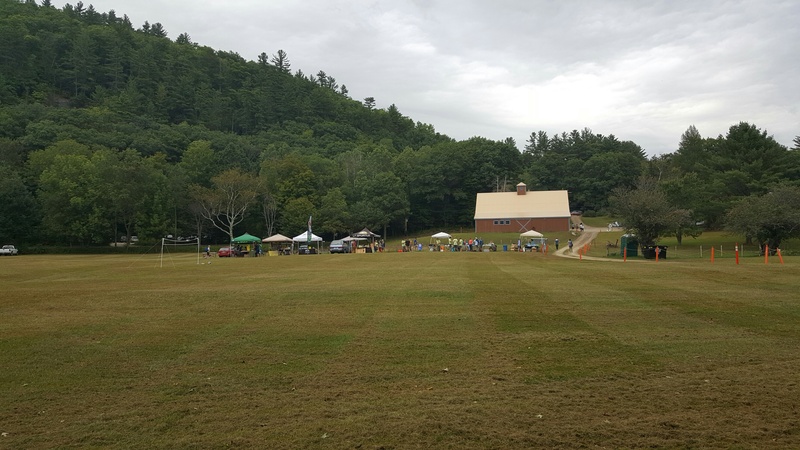 If you are seeking more challenging terrain, drive over to Stowe and the Cady Hill Forest Trail (on Mountain Road, not far from the intersection with Route 100). You’ll find a mix of beginner, intermediate, and advanced singletrack trails. The trails are generally smooth and windy, with some quad-burning climbs. For some of the prettiest views around, drive to Stowe and pay the $23 fee (+$8 per each additional passenger) to head up the Auto Toll Road. Follow the twisting road to a parking lot on the summit ridge, next to the visitors’ center. 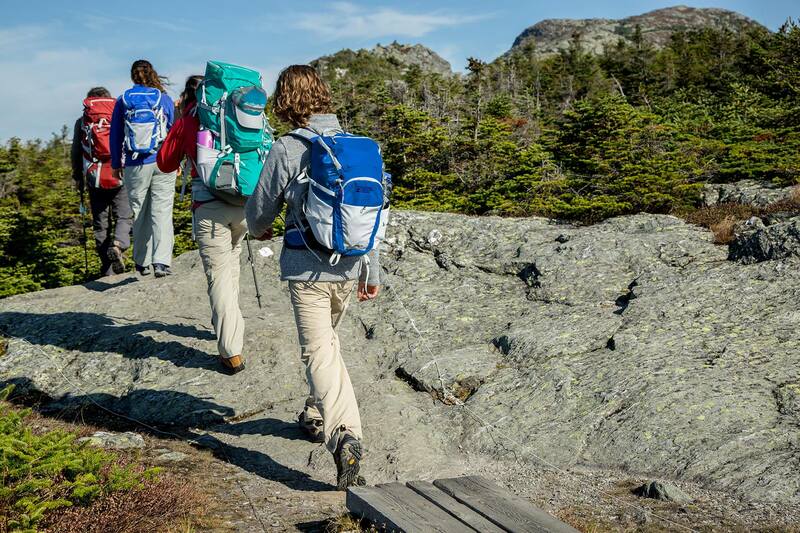 From there, hike 1.3 miles (600-foot elevation gain) along the Long Trail to the summit. Bring sunscreen, because you’ll be on exposed rocks for much of the way. Look for the geological survey marker in the stone at the tip of the summit. Fun Fact: For those who have skied at Stowe, the Green Trail “Toll Road” is actually the Toll Road that one drives up in the summer and fall! Sterling serves as one of the three peaks at Smugglers’ Notch Ski Resort. 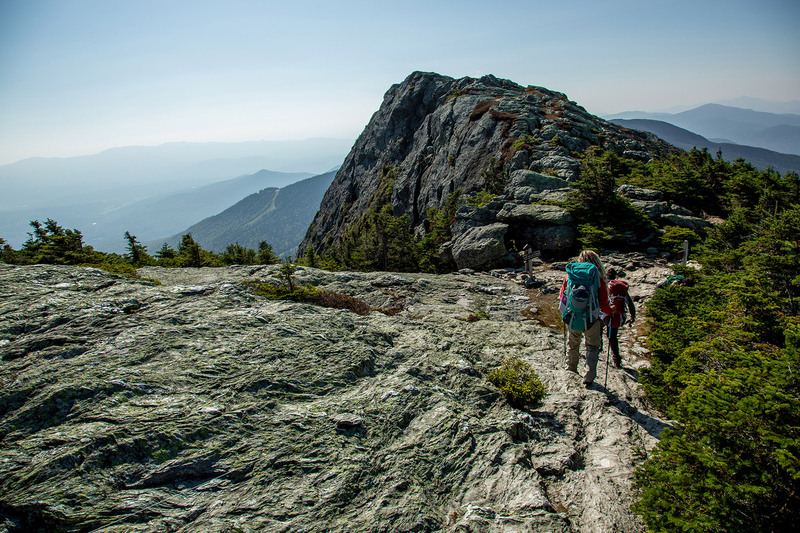 Hiking up the backside of the mountain in late spring, summer, or fall is a terrific way to access Sterling Pond, which sits a stone’s throw from the top of the Smuggs’ lift. The trail is steep in most spots and is slippery when wet. It’s 2.5 miles out-and-back with a 1,066-foot elevation gain. We hiked up pre-dawn with headlamps to catch the sunrise over the pond—well worth the effort, I can tell you. The views are spectacular, at sunrise and otherwise. Campers are welcome at the pond; there’s a lean-to that can accommodate approximately 10 folks, but not too many flat surfaces for tents. To access the trail, head up Mountain Road (Rt. 108) from either the Smuggs or Stowe side and park in the parking lot at the top of the notch. The trailhead is directly across the street from the information station. Both activities are accessible from the parking lot at the top of the notch on Mountain Road (same as above). Huge boulders have fallen from the mountains over the ages and are known as the Smuggler’s Notch Boulders. Just steps from the parking lot, caves have been formed within the clusters of boulders. Wander in and out of the spaces and marvel at the size of the boulders. A few of the more amazing spaces require a bit of scrambling to access the interior. 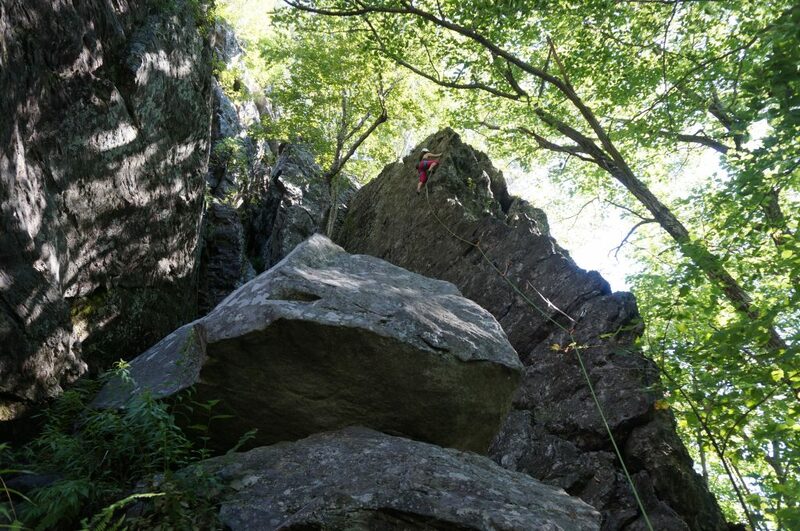 Bring your crash pads and get after the amazing boulders of Smuggler’s Notch. 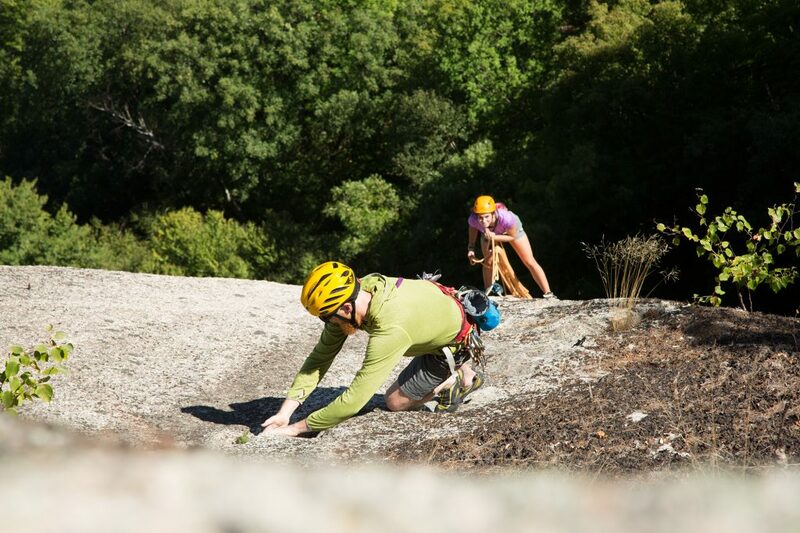 Situated on either side of Mountain Road, the boulders present a range of difficulty levels. Pick your problem and go about solving it. Just make sure to have a spotter or two along for the adventure. It’s really amazing to see folks climbing the boulders just steps from the beautiful twists and turns of Mountain Road. A group of cyclists took a break to watch us and others work on the rocks. The Lower West Bolton area is a popular climbing spot in Bolton Valley, located just off Route 2 on Notch Road. It can be busy after work or on weekends in the warmer months. Take your pick between leading a route or top-roping. An easy trail leads to the top if you prefer to top-rope, and large trees and bolts are available to serve as anchors. 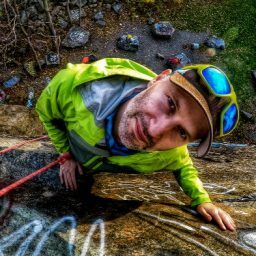 The difficulty of routes ranges from 5.5 to 5.10b. 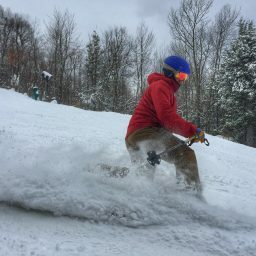 There are five terrific options for skiers (four for riders) within an hour’s drive from Burlington. Stowe Mountain Resort is the largest of the bunch and draws the most visitors per year. With 116 trails and 485 acres of skiable terrain, Stowe has something for everyone. Smugglers’ Notch backs up to Stowe and covers three mountains. The main draw for Smuggs, as it is affectionately known, is the wonderful children’s program. Top-notch instruction, coupled with wholesome and educational entertainment, has earned Smuggs a well-deserved reputation as a top destination for families. Mad River Glen caters to a different crowd with their “Ski it if you can” mantra. With some of the toughest terrain in New England and a skier-only policy (sorry, boarders), Mad River Glen has a cult following among experienced skiers. Less well known is the terrific and affordable Bolton Valley. Only 25 minutes from town, it boasts 71 trails over three peaks. The closest resort to town is Cochran’s Ski Area. While it’s the smallest of the five, it’s perfect for families with small children. It’s only 15 minutes from downtown Burlington and serves as a learning mountain for little and big ones alike. For breakfast and brunch, you need to visit The Skinny Pancake. I have two words for you: Noah’s Ark. Just order it. Trust me on this one; I wouldn’t steer you wrong (you’re welcome). The good folks at The Skinny Pancake have developed an ingenious menu, centered around crepes, that features sweet, savory, and healthy offerings, allowing this establishment to stay busy from 8 a.m. to 10 p.m. Comfort food writ large. Find all of the classics (shepherd’s pie, wings, meat loaf, etc.) paired with terrific beers brewed on site. The house-made, flavored seltzers were a hit, as well. Just what you need after a long day of adventure, without breaking the bank. For a top-notch meal, look no further than The Farmhouse. Order communal appetizers and watch them disappear in mere moments as people figure out how damn good everything is. Better not be in the bathroom! Our visit in late September corresponded with local Oktoberfest celebrations, and The Farmhouse had filled three chalkboards with different types of märzen lagers for the occasion. 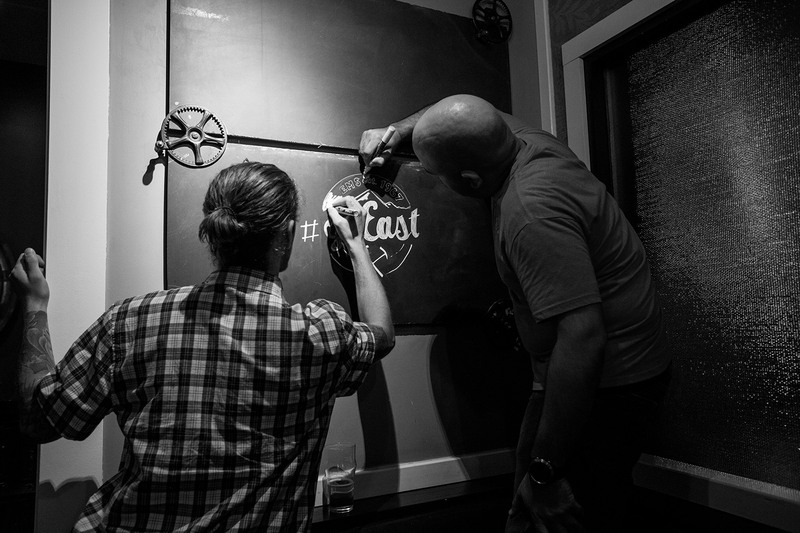 And, speaking of chalkboards, we may or may not have taken over one of the boards and added a little #goEast artwork. 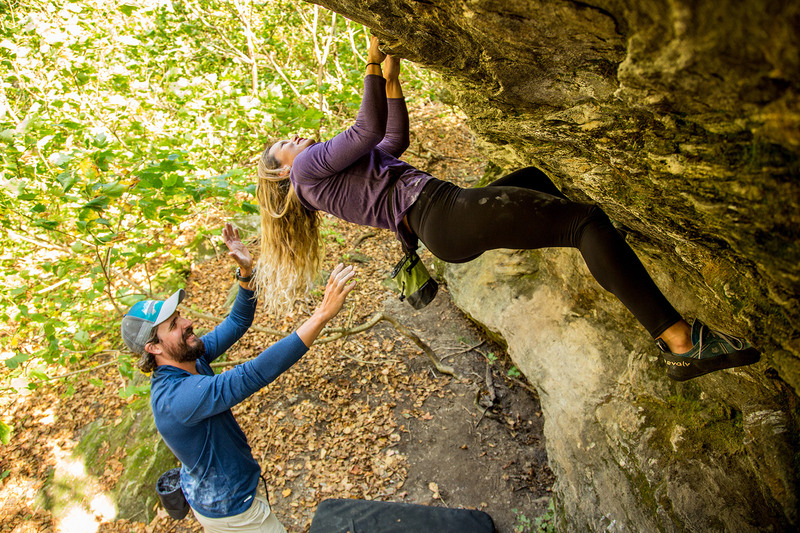 Fall is the perfect opportunity for rock climbers to take advantage of the cool air and increased friction, escape the White Mountain crowds, and do a little high-angle leaf peeping. 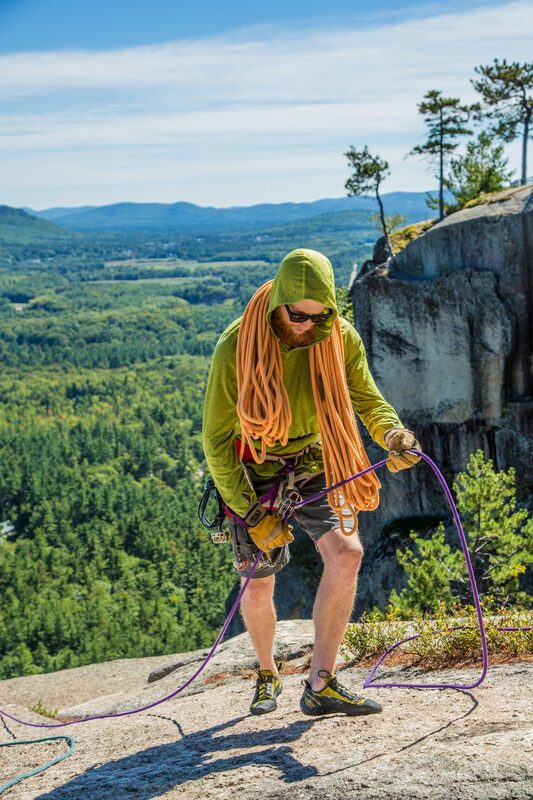 And, those seeking out moderately-rated routes and great views won’t need to look any further than the slab climbs found in and around Crawford Notch. Mt. 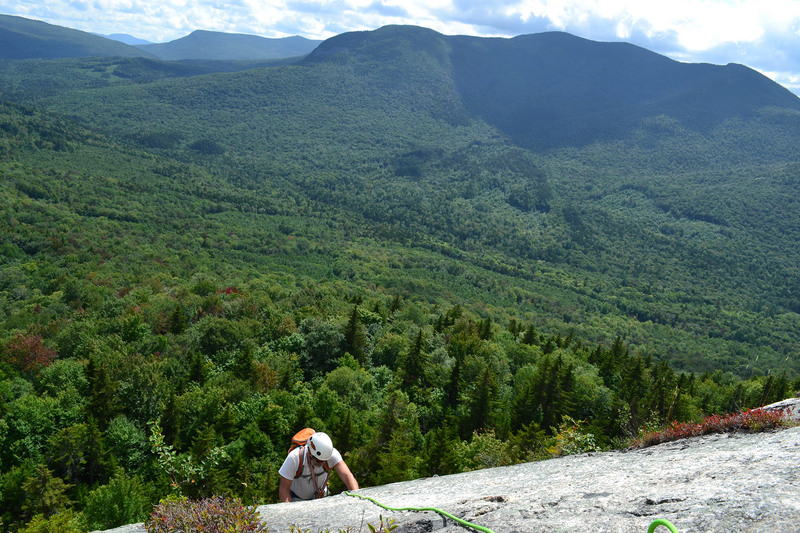 Webster’s Central Slab has some of the region’s best climbs. 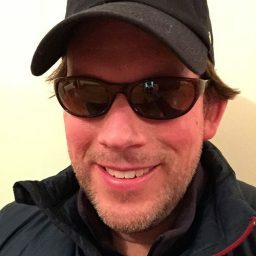 Popular moderates—Lost in the Sun, Direct, and A Bit Short—all go at 5.6 or less and have bolted cruxes and belay anchors. 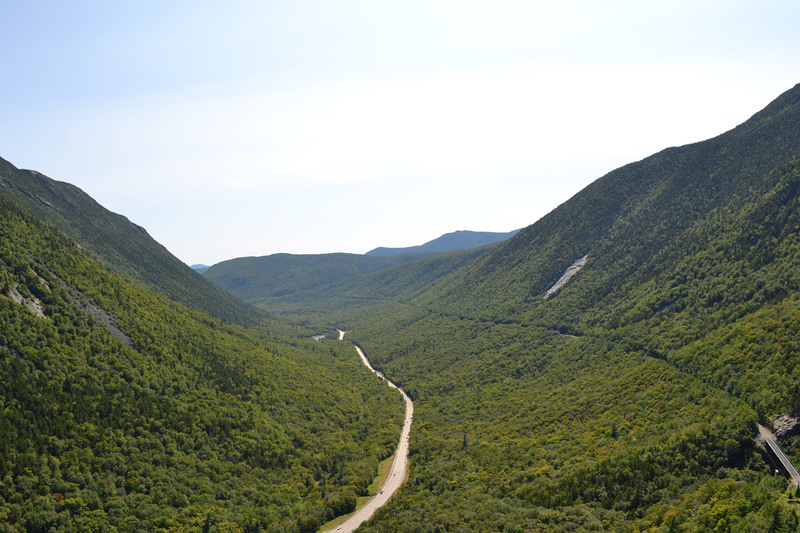 About 1,000 feet long, each offers bird’s-eye views of Crawford Notch, Willey’s Slide, and, in the distance, the Pemigewasset Wilderness. Even better, the 30- to 40-minute uphill approach is such a good crowd deterrent that you’ll rarely encounter too many parties. For first-time visitors, acing the approach might be more of a challenge. 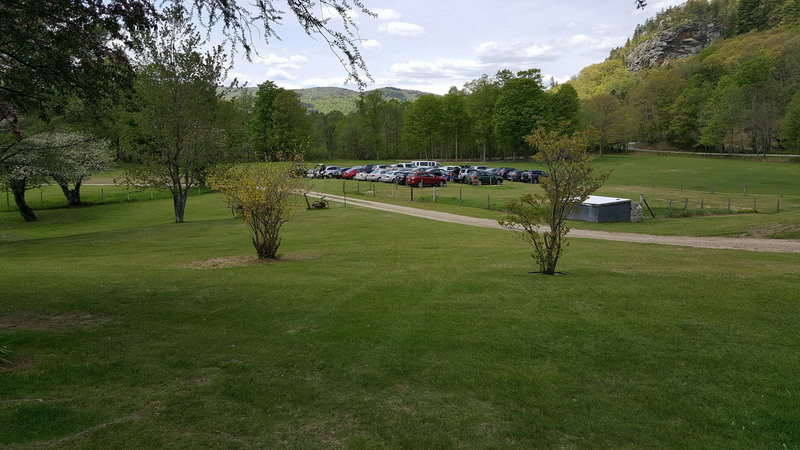 If you’re coming from Conway, park in a small dirt pullout on Route 302, just after the Willey House on the left. Climbers coming from the I-93 side of 302 should use the slab itself as a reference, as the pullout is almost directly across. From here, walk across the street and cross the Saco River. Orange ribbons and small cairns lead you uphill on a climbers’ path into the approach gully and the base of the climb. Pro Tip: Leave some post-climb beers in the Saco to chill. Lost in the Sun and Direct both leave from the toe, while A Bit Short starts a little up on the right. All three climb interesting slab, interspersed with some fun flakes and overlaps on mostly clean rock. Every belay station offers great views, but be sure to check out the flattish one at the end of Lost in the Sun and Direct. 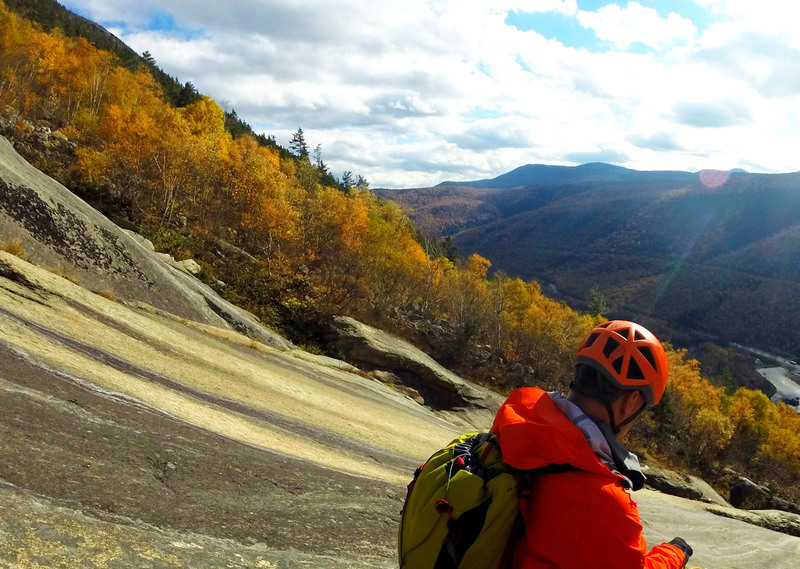 Here, sit down, take off your climbing shoes, have a snack, and soak in the expansiveness of Crawford Notch’s foliage, before you transition to the rappel. 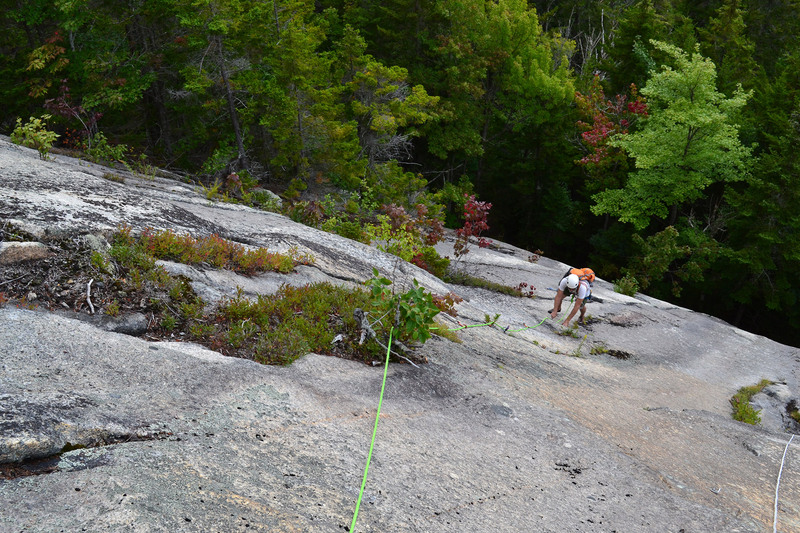 Note: The route requires two ropes, and there is no walk-off. 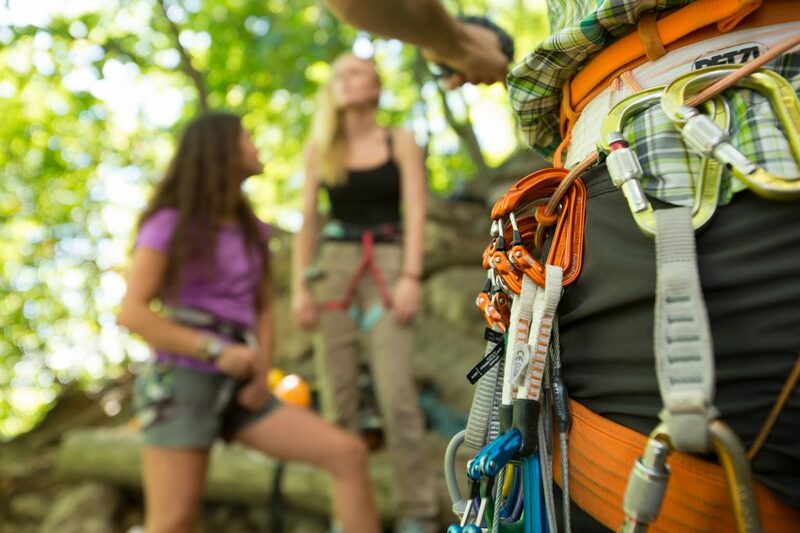 In terms of gear, first-timers should bring a standard rack up to two inches, along with a few doubles of smaller cams. As well, some of the pitches—especially on Direct—have several bolts. So, to prepare, consider adding multiple quickdraws to your normal assortment of runners and alpine draws. If long approaches are a turn-off, then check out Mt. Oscar’s West Wall, home to New Hampshire’s most European approach. Simply park at the Bretton Woods ski resort, walk 100 yards to the chairlift, and take it ($5 per person) to the top. From here, hike west on a gravel road for 10 minutes towards the West Mountain summit, enter the woods, and turn left at a wooden sign for West Wall. Then, walk downhill through a pine forest for 10 to 15 minutes to the wall’s base. 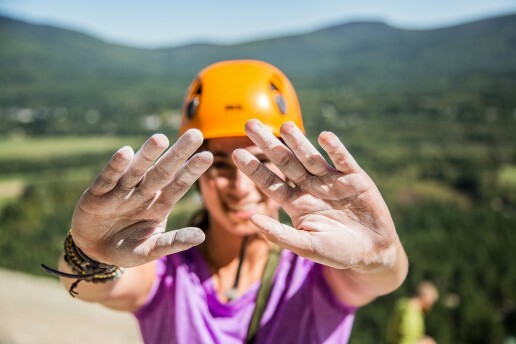 The 300-foot tall West Wall has about nine multi-pitch routes ranging in difficulty from 5.4 to 5.7. The slab climbing is fun, with bolts where you want them and generally good gear interspersed. Moreover, it’s a great place to take less-experienced leaders. Specifically, the pitches are short, and every belay station includes bolted anchors with rap rings. However, the shade-induced dampness does make the climbs’ first 10 feet a little slippery. Once you get above the second pitch, make sure to turn around and enjoy the wilderness behind you. From left to right, you’ll see Mt. Tom, Zealand Notch, the Pemigewasset Wilderness, Mt. Hale, and the Sugarloafs. As you climb higher, look for Mt. Carrigain looming in the distance. Most West Wall climbs eventually converge into Guides Route, which becomes markedly easier on the fourth and fifth pitches. 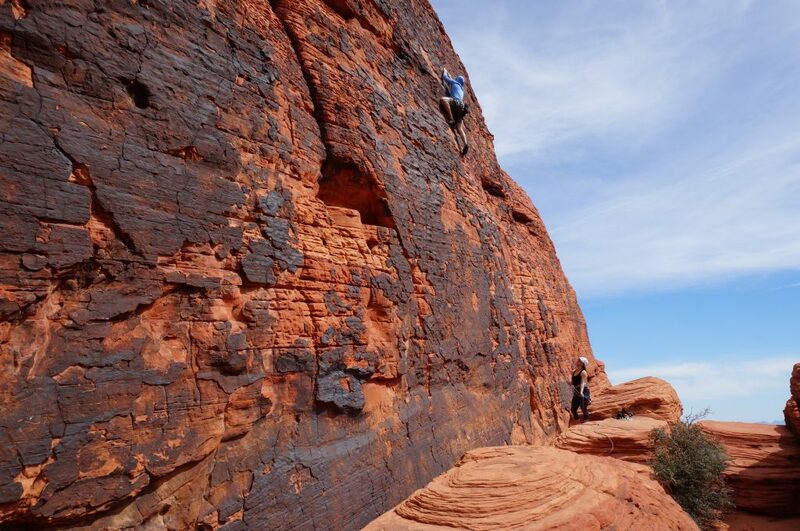 As a result, many try a route’s first few pitches, rappel to the ground, and then head back up another route. When you’re done, simply keep climbing up Guides Route, until you can scramble on third-class slabs to the West Mountain summit. From there, savor the views as you unrope and pack your gear for the short hike back to the chairlift. Mt. Willard’s two-tiered slab looms as one of Crawford Notch’s most prominent landmarks. Home to some of the Whites’ first technical climbing, this is the place for fantastic views and fun, history-steeped routes. To get to Willard’s Main Slab, park on Route 302 at the dirt pullout just south of the Silver Cascade parking lot. A well-tread trail leaves from the back, heading directly uphill to Hattie’s Garden and a railroad track. Turn right, and follow the track for five to 10 minutes to the loose gully that climbs up to main slab’s bottom left side. Pro Tip: Put your helmet on here. Hugo’s Horror Revisited, the slab’s “easiest” route, begins here. The starts for two other popular routes—Time-Space Continuum and Across the Universe—are along the climbers’ path to the right. Compared to similarly-rated routes on West Wall and Central Slab, the climbing on Willard is stout. Further, although you’ll find some bolts in between the bolted anchors, the runouts sometimes feel spicy, and you won’t always find good gear in between. Some loose, crumbly rock on a couple segments also complicates matters. All that said, the view down is unparalleled, especially during peak foliage season. Mt. Webster’s slabs command it to the southeast, soaring above the Saco River and Route 302 to the notch’s southern end. In the west, Mt. Willey’s forest and slides reach 4,000 feet in elevation. 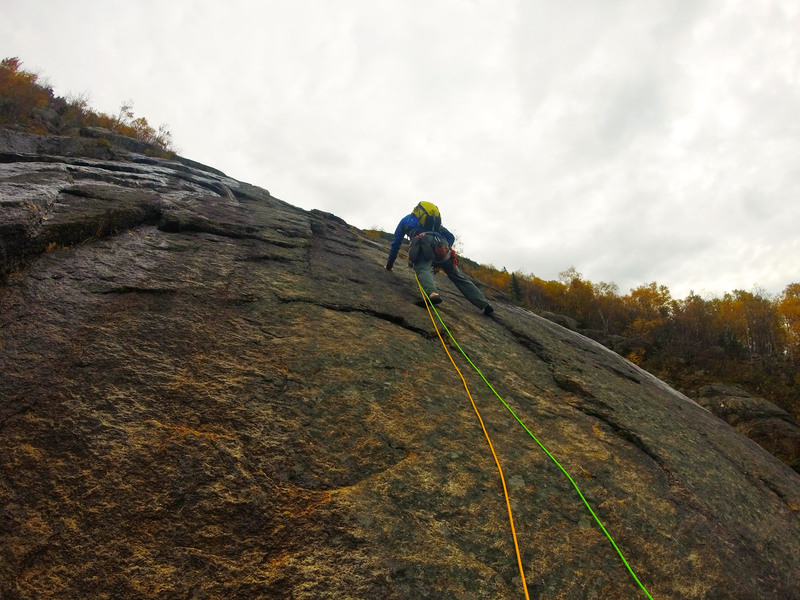 There is much to love about climbing in Crawford Notch, and in the fall, these crags get even better, as the bugs go away and friction improves. Best of all, after a rope-length or two, you’re far removed from the leaf-peeping masses and get rewarded with a view that beats anything they’re seeing down below. Two summers ago, we were preparing for a trip to California’s Mount Shasta. Our group of four had plans to climb up multiple routes—Avalanche Gulch as a “warm up” and then either Casaval Ridge or a glaciated route on the mountain’s north side. But, as we began to pile the gear into duffels for our cross-country flight, we realized we had a problem: We needed to bring a lot of gear. 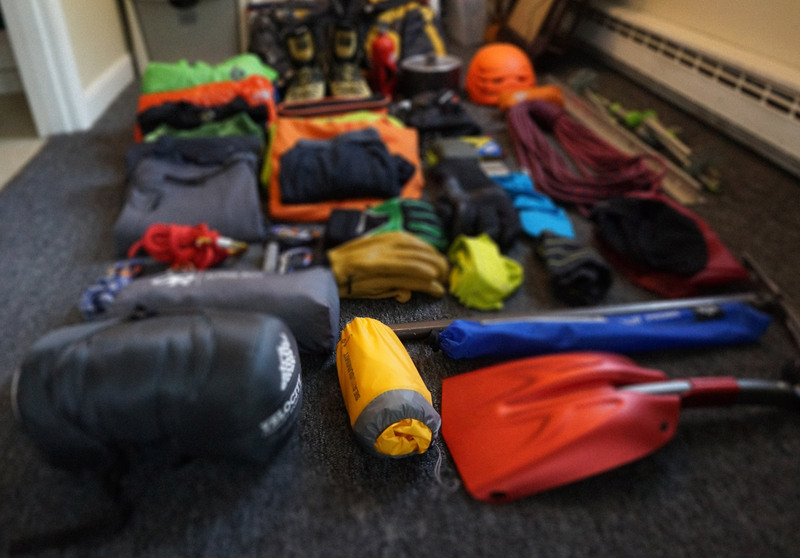 As the duffels quickly filled with ropes, crampons, ice axes, tents, stoves, and sleeping pads, our concerns grew. How were we going to get everything across the country and then up the mountain? Not wanting to pay through the nose for extra or overweight bags, we each began to look closely at the gear we truly “needed” to bring. A first pass allowed us to cull some stuff. Out went the mountaineering tent in favor of a tarp shelter, and we did the same for a second stove. Climbing gear was pared to only essentials. But, this only got us so far. Our duffels were still too many and too heavy. One thing we recognized was that, while airline staff measure your carry-on, they don’t weigh it. So, we filled our carry-ons with all the heavy stuff. But, since most mountaineering gear is sharp, and thus can’t be in the passenger cabin, this too only got us so far. Furthermore, some permissible items, like our closed-cell sleeping pads, didn’t fit, no matter how creatively we tried to stuff them. Enter the lightweight and super-small Sea to Summit UltraLight Sleeping Pad. It was around the time that Sea to Summit entered the sleeping pad market, and their first salvo looked like it already hit its mark. The pad packed to the size of a small burrito, and the regular size weighed just 12.5 ounces. When we saw it, a light bulb went on. It looked exceptionally comfortable and, more importantly, would fit in our carry-ons. 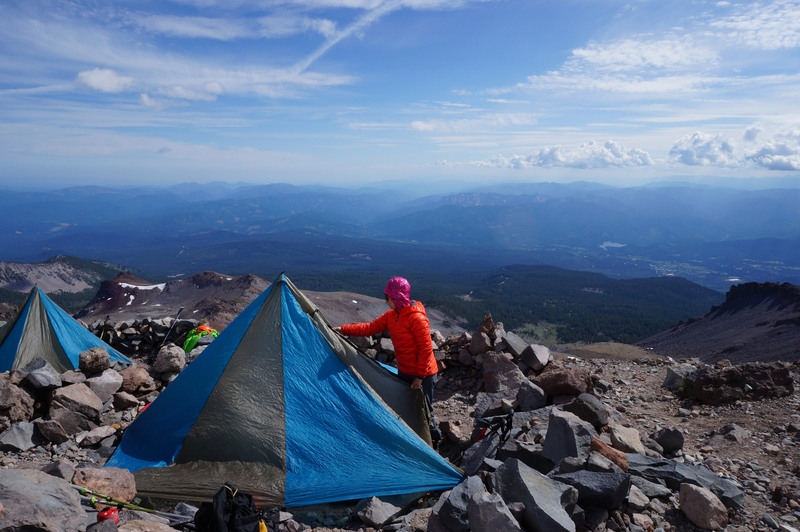 But, we were all initially dubious: Would the lightweight material stand up to several nights of rocky bivvies on Shasta, especially now that we had skimped on a tent with a floor? And, the thought of the pad popping, and a sleepless night at altitude before that all-too-early wake-up call left us wondering whether the expenditure was worth the risk. Turns out, the pad was way better than expected. It packed up as small as advertised. Due to its 181 Air Sprung Cells creating little pockets of air to lift you two inches off the ground, it also proved to be even more comfortable than we anticipated. Specifically, the cells help prevent the air from shifting under your body weight and provide even support across the entire mattress while never producing the bouncy-castle feel of other inflatable pads. Finally, durability wise, it survived several days on Shasta with ease, and has since become a fixture of our overnight kits. And, for those taking the pad to cooler climates, the insulated versions are sure to keep you toasty. On our trip to Mount Shasta, the Sea to Summit UltraLight Pad more than paid for itself by helping us avoid extra baggage fees. And, over the years, it has continued to pay its way by keeping our luggage under the airline’s restrictions. Furthermore, having the pad in our carry-ons benefitted one trip in particular, as we had a near-miss with an airport bivvy. These days, whether we’re doing a trip out West, a long hike like the Pemi Loop, or a stealth car bivy in a random parking lot, it’s a sure bet that the Sea to Summit UltraLight Pad is there to let us sleep in comfort.